"Starting with just a sketch on a napkin, Prolific created and laid out a method for developing a new type of gaming system..."
Almost a decade ago a prominent Las Vegas video slot manufacturer came to Prolific with a very challenging proposition. They wanted to create the next wave of gaming entertainment, and they were up against some very hard hitters that were attempting to beat everyone to the starting line. They needed a company with talent, experience, and speed. Starting with just a sketch on a napkin, Prolific created and laid out a method for developing a new type of system that would be easy to develop original and dynamic games on a solid platform that could be brought to market faster and cheaper than the competitors. The result was the very popular Bandit™ system that spawned a line of fun popular games and was bought up by Aristocrat. Prolific began a relationship with Bally (Alliance Gaming) that continues on today. From original themes to positioning products for international markets, Prolific provides a complete menu of resources and talents. Spectre Gaming sought the services of Prolific to answer the rapidly growing demands of the Native American and State and Charitable gaming markets, as well as the classic Class III video slot machines. As a full service provider, Prolific offers a complete package, from web presence to Casino deployment. Repeatedly--internationally recognized companies seek our services to create original products, and strategically place products that set them apart in crowded markets. For Konami, Prolific brought to reality a completely new concept in video slots. "Rise to Riches" took a novel approach and was a hit with the players. When ShuffleMaster sought a creative team to energize their video slots division, they chose Prolific. 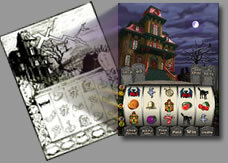 Working in concert, the team created innovative products including branded and original video slot games.